As a book marketing consultant, I’ve received countless calls and emails from authors who finished their manuscript then nervously realized they hadn’t given much thought to marketing their book. Writing the book was hard. Now, the real work begins and a lot of authors get stressed because they waited too long to finally focus on the promotional process. It’s one thing to write a book. It’s a completely different challenge to get thousands of people to buy it. I’ve taught over 450 authors how to face this daunting task, and I’ve helped my clients hit the New York Times bestseller list three different ways, including new fiction, new non-fiction, and backlist non-fiction. I’ve even published two books myself and learned how to build my own platform and make a good living from my writing. Notice that I didn’t mention social media, print advertising, or traditional publicity, such as radio/TV interviews. That’s because those channels have proven to be inferior at selling books compared to email and online influencers. Certainly, if an author has their own radio or TV show or is filthy rich, that changes the possibilities for success. But, most authors don’t have those options. So, let’s focus on what it takes for the typical author to succeed. You can usually predict the outcome of a book release campaign based on the size of an author’s email list and how many influencers have confirmed to help spread the word. Acquiring 6,000 pre-orders is the minimum amount usually required to pursue hitting the New York Times bestseller list. Therefore, an email list with 100,000 subscribers can put an author in a good position. Additional pre-orders can come from influencers, which I describe next. An influencer is by definition someone who can directly influence other people’s decision to purchase a book. In addition, a true influencer has a sizeable audience of at least several thousand fans and followers. When an influencer talks about a book, interviews an author, or tells people to purchase, then hundreds, if not thousands, of sales can quickly occur. When you combine the power of a large email list and numerous influencers into a well-timed campaign, you can hit the bestseller lists and sell a ton of books. Plus, you build momentum for word-of-mouth that makes sales continue for the long-term. Full disclosure: Can authors hit the bestseller lists without using email or influencers? Yes, on rare occasions, books will generate uncommon word-of-mouth and take the world by storm. Or, a big publisher might choose to create a bestseller by putting all of their resources behind one title. But, these occurrences are extremely rare. More importantly, you’d be unwise to base your marketing plan on an anomaly that you can’t replicate. That’s why I stress the promotional power of email and influencers. Those are elements that any author can replicate with hard work and dedication. In order to set proper expectations for your next book campaign, you need to assess what you’ve done to build your email list and connect with influencers. Otherwise, you could set yourself up for failure. I don’t want to you fail. I want you to sell a lot of books. Do you have a large email list and confirmed connections with numerous influencers? If yes, you are in position to run a major book campaign that can generate significant pre-orders and make a run at the bestseller lists. This type of campaign is like the perfect 1-2 combination punch for marketing a book. You get the power of big influencers telling thousands of people to buy your book. Plus, you’re able to rally thousands of your own fans to purchase at the same time. I’ve had the pleasure to consult with several authors to build this type of campaign and watch them become bestsellers – a rare honor that lasts forever. What if you have a great network of influencers – but don’t have a large email list? A lot of popular personalities are in this position, such as celebrities, athletes, pastors, TV hosts, etc. They know a ton of influencers, but they’ve never taken time to build their own list. Too often, they rely too much on social media and get burned by it. In these cases, the author can run what I call a “Buddy-Buddy” campaign. That means the book sales come from cashing in favors with as many influencer buddies as possible. If enough buddies participate, then a lot of books can be sold. However, running a “Buddy-Buddy” campaign can be a bit tenuous and nerve-wracking, because you’re never actually certain who will help out. It can feel like you’re herding cats and stressing out over empty promises. In order to run a successful campaign based on influencers, it’s best to get an early start and develop a network you know is solid. Help out other influencers first, so that they’ll feel a desire to return the favor. For example, take time to promote their books, interview them with your audience, donate to their cause, or whatever it takes to build a solid relationship. A book campaign based on a network of excited influencers can help sell thousands of copies. Maybe you don’t know many influencers, but you’ve got a growing email list. 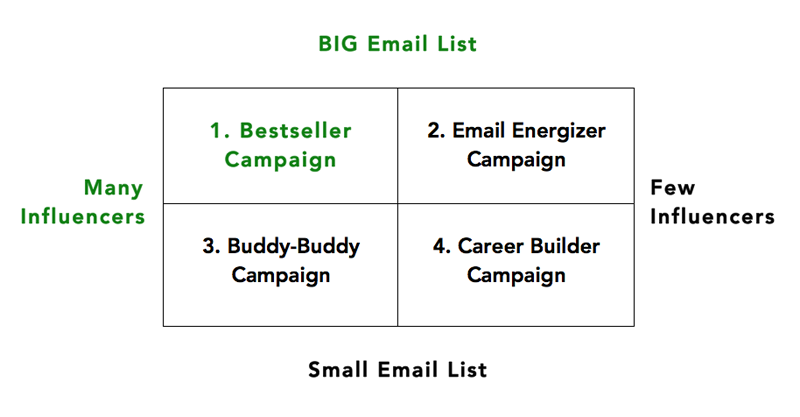 In this situation, you can conduct what I call an “Email Energizer” campaign. You are relying primarily on the strength of email subscribers to energize book sales. The larger your list, the larger you can generate immediate orders. In addition, you can ask your subscribers to help spread word-of-mouth by giving simple promotional tools to use. Building an email list takes time. But, you can add thousands of subscribers per year by using a combination of enticing free content and online advertising to attract attention. I routinely use my email list to help launch new teaching tools and video courses. I like the power of an Email Energizer campaign because it’s a promotional tool within your complete control. Are you an author without many email subscribers or a network of influencers? That’s okay, because every author starts at the beginning. I remember publishing my first book when I didn’t know anyone. It was a scary feeling, but I was driven by inner passion to try my best to grow my audience. I wasn’t an overnight success. But, over time my sales began to increase. Likewise, when you’re just starting to build your author platform, you can conduct what I like to call a “Career Builder” campaign. It’s what I experienced first-hand, and it’s a great path to long-term success. Even though you can’t sell many books today doesn’t mean you can’t sell many books in the future. My hope is that you will take a long-term approach and use your new book to build a solid foundation. You’re not trying to hit the bestseller lists. You’re not trying to be a one-book wonder. Instead, you’re focused on creating the basis for an author career that lasts for years and writing several books. If I may be frank, the bestseller lists are overrated. Sure, it’s a nice honor. But, it’s more important to continually grow your readership, enjoy being an author, and make enough income to sustain writing as long as you desire. Personally, I’m more impressed by an author who consistently sells thousands of books and happily makes a great living, rather than a flash-in-the-pan bestseller. Let a “Career Builder” book campaign put you on the enjoyable path to steadily pursuing your writing dreams. Based on the size of your email subscribers and influencer network, which type of book campaign makes sense for you? If you have both elements in place and would like help with strategy and managing the details to insure success, contact me for custom consulting. 2. 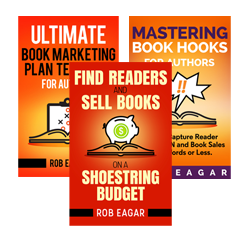 Take my online e-course: “Find New Readers and Sell More Books on a Shoestring Budget.” Click here to find out the next open course date. 3. Read over 30 free articles in my Author Marketing Library.